Trying to find support for a vaginal birth after a c-section (VBAC) can be a struggle; when you are black, overweight, on Medicaid, and in Alabama, it can be almost impossible. 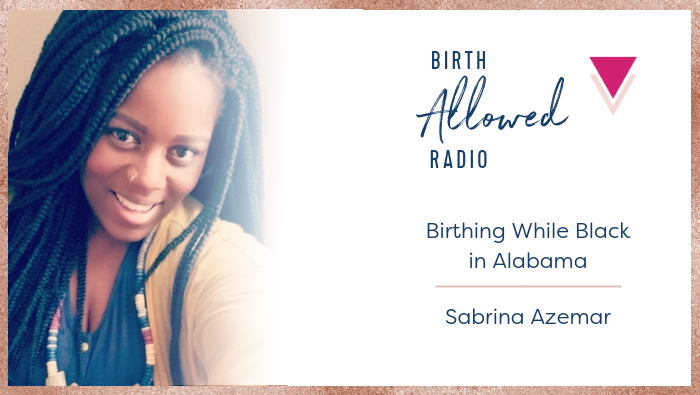 Our guest Sabrina Azemar recounts her difficulties convincing her maternal care providers to “let” her do what pregnant bodies have been doing for centuries. Sabrina is the mom of 3 children, and a breastfeeding and cloth diaper advocate who loves to teach women of color in her community sustainable and alternative ways to care for their families. Sabrina’s doctor told her she was putting her baby at serious risk by considering a vaginal birth. She was told that women of color have low success rates with VBACs and she could potentially kill her child, just by doing what the body is designed to do. “On Medicaid, you have a government birth.” You are supposed to listen to your doctor and shut up. They say every birth is different, but they treat every pregnancy the same. So what is Sabrina’s advice to other mothers in her situation? • Be confident when you go to your appointment and save your tears for the car. • Sit the regular chair in the exam room, fully dressed, until you understand and agree to the tests they want to perform. You are treated as though you are inferior when you are in the exam chair. • Have someone that can go with you to advocate for you. • Write down your questions on a physical sheet of paper; don’t let the appointment end until they have been answered. Practice saying your questions out loud. • Don’t be afraid to change doctors. • You have to be present in your pregnancy and birth. It has everything to do with your body. Own the experience. All people want is a conversation with their health care provider. There are good doctors out there, and it is important that you find one that wants you to have a successful birth. You deserve a good birth story.